company based in Birmingham, UK. We have a vast amount of experience and knowledge in roofing and cladding. Our team specialises in roof sheeting, cladding, flat roofs, liquid plastics, new build, repairs, roof light replacement, asbestos maintenance and removal, gutter repairs and maintenance, storm damage, emergency repairs and annual maintenance contracts. We also arrange plant hire, netting, steel erecting and scaffolding. 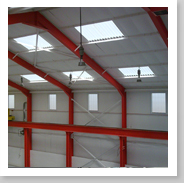 We have been working ONLY on industrial roofs for 20 years. Industrial Roofing Solutions © 2014. Site Managed By Mulholland Software.